A total of INR 3,762 crore is allocated for grid-interactive renewable energy schemes and projects under the Budget. Out of this more than 50% goes to solar (roughly INR 2,045 crore), while 20% of the funds (~INR 750 crore) will go towards the wind sector. The funds allocated to the solar industry in India will be used for developing solar PV projects on canal bank, canal tops, greening of islands, development of solar parks and ultra-mega solar power projects, defence solar and rooftop solar schemes. The funds allocated to wind energy sector will be utilized towards wind power projects, and capacity of 4 GW is expected to be installed during 2018-19. Further, INR 600 crore has been allocated for green energy corridors projects. The budget 2018 has allocated INR 2.17 billion and INR 99 billion to Solar Energy Corporation of India and Ministry of New and Renewable Energy (MNRE), respectively under IEBR (internal and extra budgetary resources). Budget 2018 has eliminated the 5% customs duty on solar tempered glass used for manufacturing cells, panels and modules. This is an encouraging move for domestic solar equipment manufacturers. 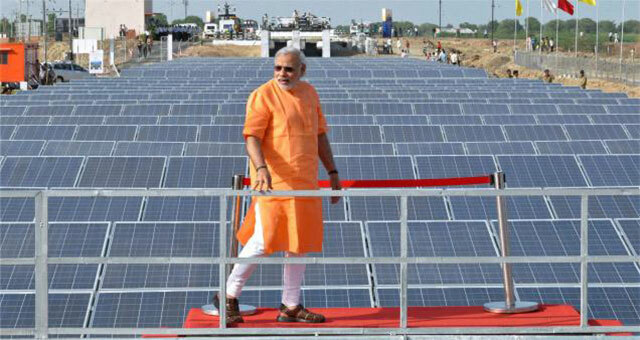 The Budget also offers incentives to Indian farmers to use solar power water pumps. It has assured that any surplus power that will be generated will be bought State DISCOMS. The government will also put in place a mechanism so that the surplus solar power generated by the state is purchased by the distribution companies. The income tax rate for smaller renewable energy companies (with revenues of up to INR 5 billion annually) was also reduced to 25%. No other new incentives or subsidies were announced. No specific annual targets were announced. The government is targeting to generate 20 GW of solar power from farmers, by encouraging solar water pumps and installing small solar projects (1-2 MW) at/ near farming sites. Through the Pradhan Mantri Saubhagya Yojana, the government is also aiming at providing electricity connections to houses in rural and urban areas. Can you resend your query please, thanks!